The findings were reported November 18 in the journal Nature Physics. The research, done at the Georgia Institute of Technology in Atlanta and at SOLEIL, the French national synchrotron facility, has been supported by the National Science Foundation Materials Research Science and Engineering Center (MRSEC) at Georgia Tech, the W.M. Keck Foundation and the Partner University Fund from the Embassy of France. Researchers don’t yet understand why graphene nanoribbons become semiconducting as they bend to enter tiny steps – about 20 nanometers deep – that are cut into the silicon carbide wafers. But the researchers believe that strain induced as the carbon lattice bends, along with the confinement of electrons, may be factors creating the bandgap. The nanoribbons are composed of two layers of graphene. 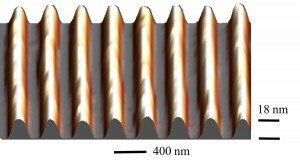 Production of the semiconducting graphene structures begins with the use of e-beams to cut “trenches” into silicon carbide wafers, which are normally polished to create a flat surface for the growth of epitaxial graphene. Using a high-temperature furnace, tens of thousands of graphene ribbons are then grown across the steps, using photolithography. During the growth, the sharp edges of trenches become smoother as the material attempts to regain its flat surface. The growth time must therefore be carefully controlled to prevent the narrow silicon carbide features from melting too much. The new technique permits not only the creation of a bandgap in the material, but potentially also the fabrication of entire integrated circuits from graphene without the need for interfaces that introduce resistance. On either side of the semiconducting section of the graphene, the nanoribbons retain their metallic properties. By growing the graphene down one edge of the trench and then up the other side, the researchers could in theory produce two connected Shottky barriers – a fundamental component of semiconductor devices. Conrad and his colleagues are now working to fabricate transistors based on their discovery. Confirmation of the bandgap came from angle-resolved photoemission spectroscopy measurements made at the Synchrotron CNRS in France. There, the researchers fired powerful photon beams into arrays of the graphene nanoribbons and measured the electrons emitted. Theorists had predicted that bending graphene would create a bandgap in the material. But the bandgap measured by the research team was larger than what had been predicted. Beyond building transistors and other devices, in future work the researchers will attempt to learn more about what creates the bandgap – and how to control it. The property may be controlled by the angle of the bend in the graphene nanoribbon, which can be controlled by altering the depth of the step. He predicts that the discovery will create new activity as other graphene researchers attempt to utilize the results. In addition to Conrad, the research team included J. Hicks, M.S. Nevius, F. Wang, K. Shepperd, J. Palmer, J. Kunc, W.A. De Heer and C. Berger, all from Georgia Tech; A. Tejeda from the Institut Jean Lamour, CNES – Univ. de Nancy and the Synchrotron SOLEIL; A. Taleb-Ibrahimi from the CNRS/Synchrotron SOLEIL, and F. Bertran and P. Le Fevre from Synchrotron SOLEIL.